The Bridge, your expert partner in post production. The Bridge was established in 2000 and over the years has earned a reputation for dedicated attention to detail, delivering a final product that meets all our client’s expectations. We like to think we achieve this because we partner with you in reaching and exceeding your expectations. Film and television post production is a technical and logistical minefield for those not familiar with the workflow, machines, spec requirements, formats and available talent in the industry. Each stage of production and post-production is made up of many different processes using complex equipment with dedicated crews, operators, artists and facilities, not to mention ever changing and improving technology. 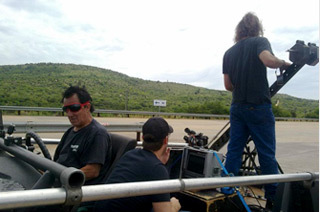 A production can be shot on film, tape or hard drive and it can be standard definition or high definition and 2 or 3D. Post production includes editing, animation, graphics, visual effects, sound effects and audio final mix, or it may simply be a voice recording or a music composition. Bringing all these elements together requires a unique team! Understanding what is required to meet a brief and knowing the best people to deliver a professional product requires some inside knowledge! Our clients rely on our expertise to ensure that the finished result meets with the client’s satisfaction. We recognised the need for a company that was geared towards "spanning the information gap"between the client, agency, production house, and the post production finishing facilities and in 2000 we set about “bridging the gap” and established The Bridge. We are a company that provides personal and dedicated management and supervision of a project’s workflow, coordinating all the elements of the job to a finished delivery. The Bridge is an editor and producer team with over 20 years experience in film and video. In an industry where no one company provides every aspect of the production and post production process we are able to draw on the talents of the best professionals in their fields and, perhaps most importantly, we match their abilities to that of the brief and manage this dedicated crew - harnessing their knowledge and skills to complement our own thereby creating a pool of talent to execute any brief to the most effective end result. 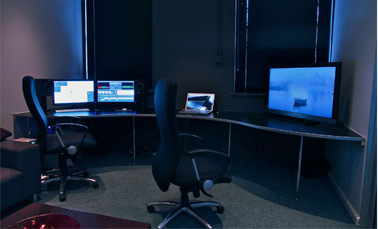 Our core business is post production, editing on the Media Composer AVID edit system. We cut commercials, image films, viral videos, music videos, feature films and television documentaries and dramas on these systems, enlisting outside suppliers to provide our jobs with animation, graphics, visual effects, sound effects, voice over, script and music elements as required. We are a company that is able to conceptualise from a brief and produce film and television solutions from a post production perspective through to full finish. We are a company that is able to advise clients on the processes involved and the time required to produce their film and audio visual briefs, thereby empowering them to manage their client’s expectations. We are a company that is dynamic enough to become a natural extension of the agency, production house, service company or finishing facility - working together with them, as a team - to produce all the requirements of the client’s brief. In some instances we “crew-up” and offer a production service to our clients, originating the material through production houses we have an established and trusted relationship with. On other jobs we supervise transfers, conversions, graphics, animation, visual effects and other high end finishing at other facilities. In short, we are a combination of technical and creative know how with the versatility and contacts to collaborate with other skilled individuals, locally and internationally, to provide our clients with total solutions for all their media needs, not only film, TV and video but across the spectrum of the electronic medium including social media networks.